28% of young people in work and almost half of NEETs feel down or depressed “always” or “often”. NEETs are significantly less happy across all areas of their lives. 10% of young people generally and over 20% of NEETs feel they cannot cope with day-to-day life. Almost a third of young people “always” or “often” feel lonely, and those who are unemployed are significantly more likely to feel this way. A quarter of young people have put their ambitions on hold due to the recession. More than a third of NEETs feel they have no future due to the recession, and over half feel their life has been put on hold due to unemployment. One in 10 young people believe they did not grow up in a supportive family environment. 42% of young people who did not grow up in a supportive environment are unhappy with their lives (compared to 14% of those that did receive support), and those that did not are twice as likely to be NEETs. Over 20% of young people say the internet gives them a sense of community and friendship they do not have elsewhere in life (rising to a third among those who are unemployed). More than one in ten young people have been bullied online. Two thirds of young people would prefer to talk to someone in person than online if they had a problem. John Vincent and I have had an article about the seminar on libraries and social justice that we gave for the University of Missouri published in Teen Librarian Monthly. I’ve just put it on my website, for those who are interested. It focuses on the discussions about library provision for teenagers from disadvantaged backgrounds, and on the fabulous contribution made by CILIP Libraries Change Lives 2012 Award winners, Skipton Rewind Club. What a treat on Monday to co-deliver a seminar for University of Missouri doctoral and masters students on the role of libraries in terms of social justice. There were lots of fascinating discussions. The differences between the UK and the US were extremely interesting. Even the term social justice is problematic in the States. But many of the challenges are broadly the same, and it was great to explore ways libraries on each side of the Atlantic are responding, and to identify strategies for improvement. John Vincent of The Network led excellent sessions on effective library provision for new arrivals and on LGBT issues. My session was on how libraries can support young people from disadvantaged backgrounds. 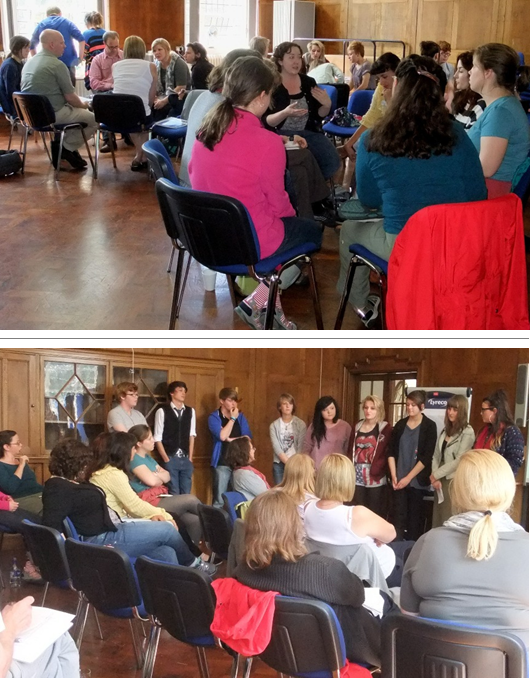 The top photo shows groups deliberating on methods for making libraries relevant and attractive to such teenagers, and breaking down barriers to use. We were enormously privileged to have a dozen members of Library Songwriters: Skipton Rewind Club, winners of the CILIP Libraries Change Lives Award, attending. Interestingly, there was a great deal of overlap in the ideas the students, university staff and UK librarians present talked about and those the young people promulgated. In particular, everyone was adamant that active involvement by young people in decision making in every aspect of provision and at every stage is fundamental to success. Staff training emerged as another very high priority: vital for combating negative attitudes and stereotypes. The Rewind members then showed us how theory can be turned into practice with a brilliant presentation on how the club operates. They were inspirational, and shared masses of ideas for good library interactions. The club has been a catalyst not just for all sorts of music-related activities, but also for better community relations. It has increased members’ skills in lots of areas, music of course, public speaking, as we saw, plus marketing, fund-raising and more. Importantly, the club is entirely collaborative and each member works to their strengths. Skipton librarian Claire Thompson gave us a valuable insight into her role as facilitator. The club ended their slot with a scintillating performance of one of their songs. A huge thank you to all who came, especially the Rewind Club members and Claire, and to York Library Service for hosting the event. I am delighted and excited that this year’s recently announced winners of the CILIP Libraries Change Lives Award, Library Songwriters: Skipton Rewind Club, will be contributing to a training course that I am co-running with The Network in York at the end of the month. The course is on libraries and social justice, and it’s for PhD and Masters students from the School of Information Science and Learning Technology at the University of Missouri. My session is on the role of libraries in supporting teenagers, particularly those from disadvantaged backgrounds. I know that the club members who are coming will add loads of inspiration. They were a huge hit when they performed and spoke at the House of Commons award ceremony. You can get a feel for their talents, and find out more about the project here.